Spain in the 15th century: 12 kingdoms, 1 county, 1 principality, and the Basque provinces. Five tribes spread: Spaniards, Basques, Galicians, Catalans, and Moors. The nobility, especially the "Grandes" (or "grand ones") of high nobility, held significant influence. However, the middle nobility, the "Caballeros", were themselves in possession of extensive privileges. All the regions of Spain were eager to develop their independence. The "Castillos" (or castles) also played an important role. In this award-winning game, players take on the roles of Grandes in medieval Spain. The king's power is flagging, and these powerful lords are vying for control of the various regions. To that end, you draft caballeros (knights in the form of colored cubes) into your court and subsequently move them onto the board to help seize control of regions. After every third round, the regions are scored, and after the ninth round, the player with the most points is the winner. A turn then consists of selecting one of five action cards which allow variations to the rules and additional scoring opportunities in addition to determining how many caballeros to move from your court to one or more of the regions on the board (or into the castillo - a secretive tower). Normally, you may only place your caballeros into regions adjacent to the one containing the king pawn. 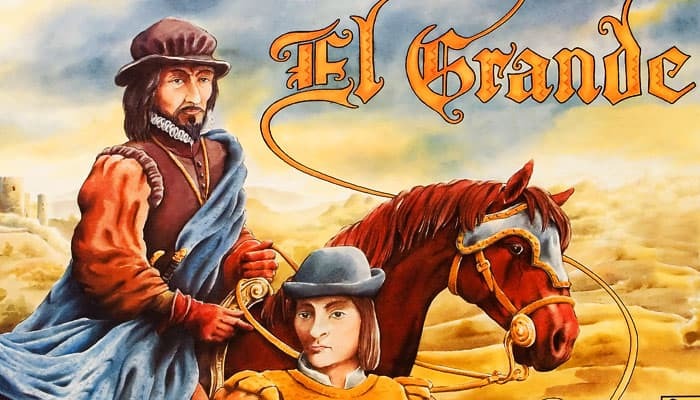 The one hard and fast rule in El Grande is that nothing may move into or out of the king's region. One of the five action cards that is always available each round allows you to move the king to a new region. The other four action cards varying from round to round. 2 Mobile scoreboards with the values "8/4/0" and "4/0/0"